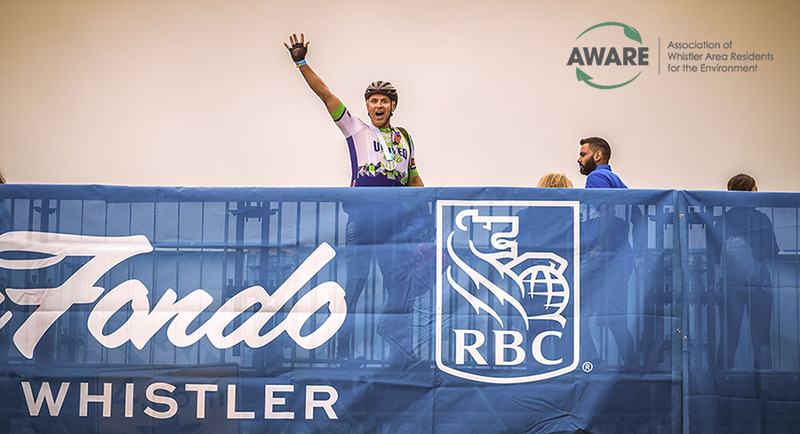 Through 2017 and 2018, we have been working with AWARE – the Association of Whistler Area Residents for the Environment – with the aim of making RBC GranFondo Whistler a Zero Waste event. AWARE have just submitted their waste report for the 2018 event, and we’d like to share with you some of its findings. Through waste sorting services, dedicated recycling stations and AWARE’s Zero Waste Hero team, of the 759,76kg of waste collected at Celebration Plaza and Lot, 673.76kg was successfully diverted from landfill. Across the event, a total of 88.69% of waste was also diverted from landfill. Waste is defined as anything from food scraps and organics, to soft plastics, cardboard and multi-laminates. An event is considered Zero Waste when 90% or more total waste does not end up at landfill. Clearly, while we are proud of being only 1% from an official Zero Waste event, we still have work to do in order to not only achieve this target, but also to go beyond that golden standard. AWARE’s report also contains a list of recommendations and best practices that we will aim to fulfill going forward. We are fortunate to live and put on this event in one of the world’s most beautiful and wild locations – British Columbia. Events have the potential to give so much to the communities in which they’re run, but also run the risk of negatively contributing to the environment. It is our hope that we can continue to not only minimize the environmental impact, but indeed turn it into a force for good through recycling and education over the future years.